In another era, Henry Flagler and Henry Plant, both bold, successful industrialists from the north with transformative visions for an emerging and hereto date wild, undeveloped Florida, forged two railroads critical to the development of our state; Florida East Coast Railroad ("FEC") and South Florida Railroad ("SEC"), respectively. But they also built "grand hotels" on highly desirable sites along their new rail line which became destinations onto themselves, and catalyzed the development of small towns which seasonal tourists from all over the country wished to visit not only to enjoy the natural beauty of this new frontier but also to experience for themselves the "comfortable", "pleasurable" and "utopian" environments which awaited them upon their arrival. Downtown West Palm Beach was once home to some 20 hotels, many along its waterfront. It is with homage to that period, and with similar hope and optimism for what lies ahead for our City that Navarro Lowrey, along with development partners Concord Hospitality and Woodfield Investments, is developing Flagler Banyan Square. 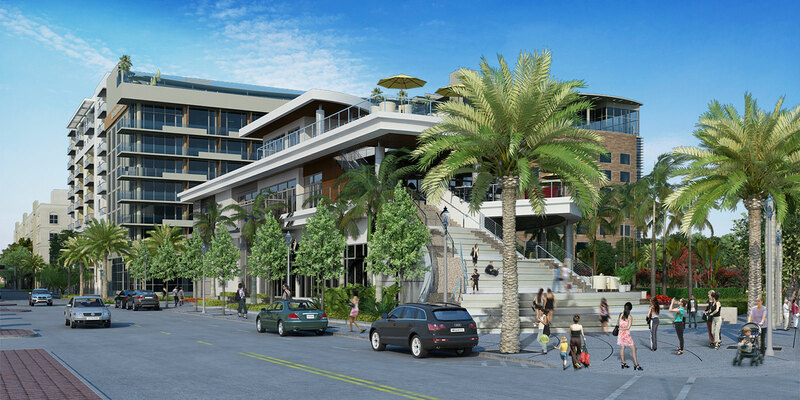 When complete, Flagler Banyan Square will return a 208-room "grand hotel" to the waterfront after a 50-year absence; deliver a fully amenitized 251-unit luxury apartment building to the site; and provide over 34,000 square feet of commercial space comprised of a waterfront destination restaurant, Class "A" boutique office space, and ground floor retail space facing Banyan and Olive. The Ben is the centerpiece of Flagler Banyan Square. Designed from the ground up for discerning travelers and locals, this hotel will capture and immerse its guests in a bygone age, while offering thoughtful modern amenities. 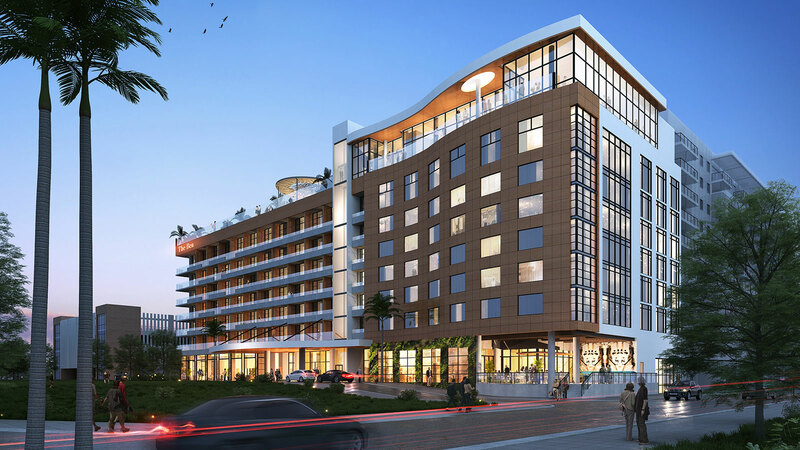 This luxurious 208-room Marriott Autograph Collection property will boast spectacular waterfront views, a rooftop pool and amenity deck with bar, and whimsical rooftop ballroom. 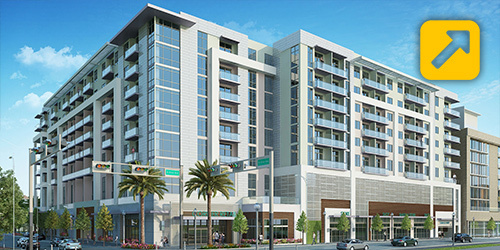 The Ben is a contemporary design rooted in the unique history of West Palm Beach. In the near and distant future, The Ben will surely become the grand setting for many spirited stories. The Oversea is a reference to Flagler's Overseas Railroad and its significance to the development of South Florida, including West Palm Beach and Palm Beach. The land at Flagler Banyan Square was once the site of a Flagler rail spur to the island of Palm Beach, connecting West Palm Beach and Palm Beach across the water. 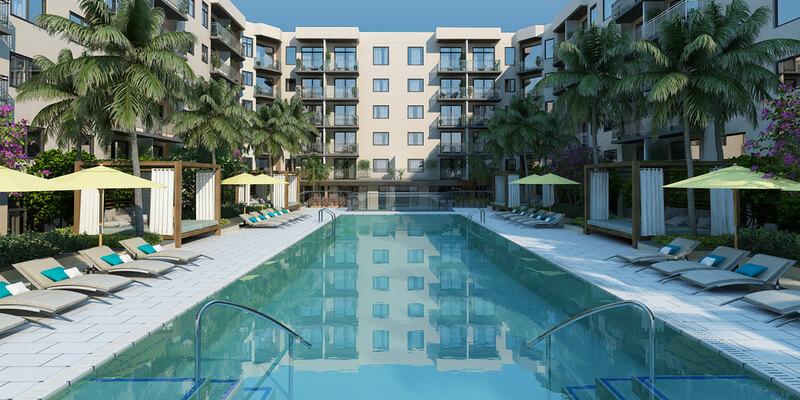 The Oversea apartments, conveniently located in the heart of downtown West Palm Beach, are similarly connected to the island of Palm Beach and its main street (Royal Poinciana Way) via the newly constructed Flagler Memorial Bridge and are a short walk to the Brightline train station. The Oversea offers the best of West Palm Beach and Palm Beach living to its residents. Street-facing retail on Olive and Banyan will provide services and amenities to the guests and residents of the hotel and apartment, as well as serve the visitors and office workers of downtown West Palm Beach (such as the County Governmental Center across the street from Flagler Banyan Square). 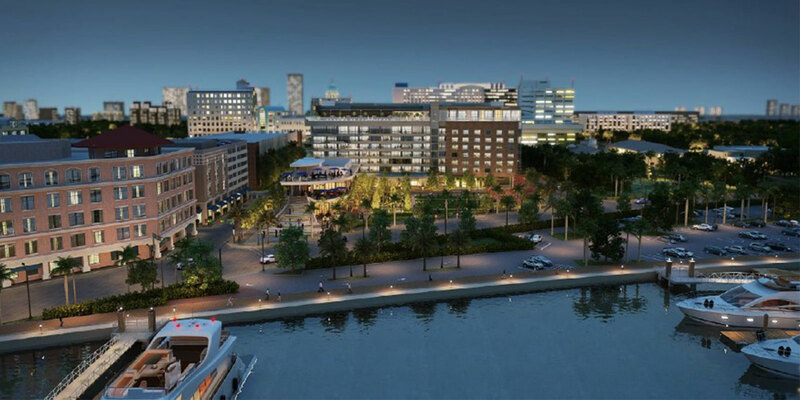 Anchoring the south end of The Square will be a waterfront dining destination with intracoastal views and indoor/outdoor seating options. The second floor of the building will contain office/retail space while the third floor, known as Rooftop Flagler, will be available for private events. 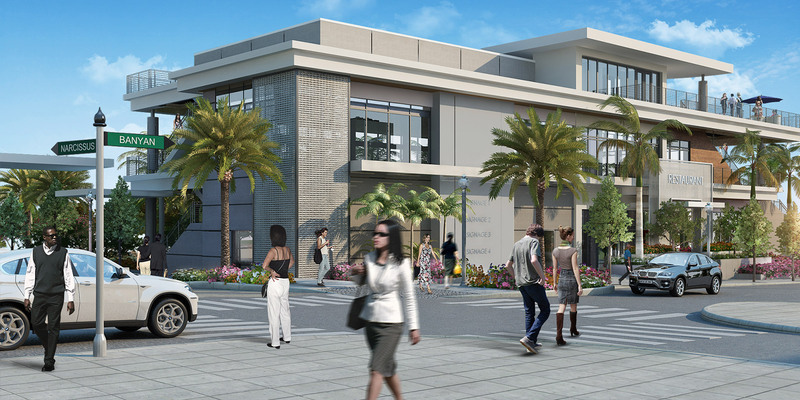 The retail components of Flagler Banyan Square will activate the entire block with engaging street level retail that will enhance the vibrancy and walkability of the downtown. 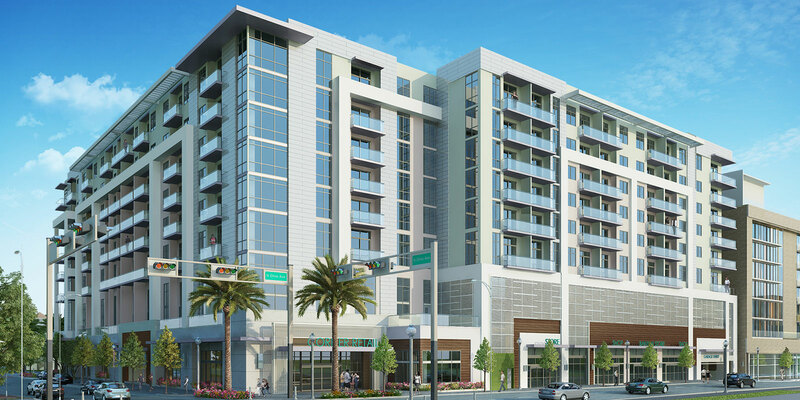 Click here for more information on retail leasing opportunities. 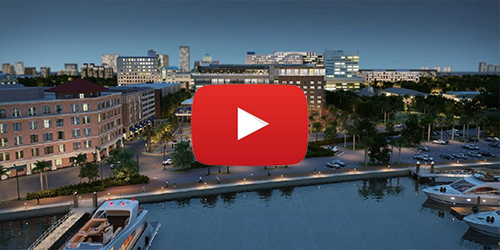 Anchoring the south end of The Square will be a waterfront dining destination with intracoastal views and abundant indoor/outdoor seating options. The restaurant opportunity consists of 7,571 rentable square feet of air-conditioned space and approximately 3,500 additional square feet of outdoor covered/uncovered outdoor seating. In addition to the building's restaurant use, the second floor will contain additional office/retail space and Rooftop Flagler on the third floor. 6,296 rentable square feet of premium office space is available for lease on the second level of the building anchoring the south end of The Square. 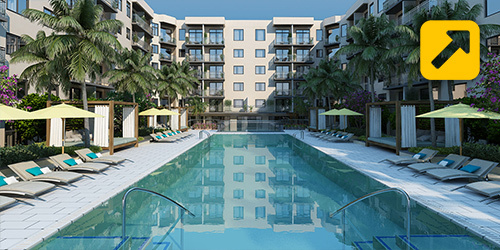 This boutique offering overlooks a beautifully appointed, active urban square; marina; and the Intracoastal Waterway. 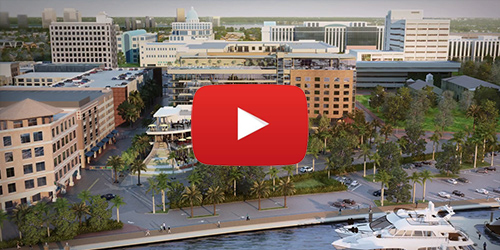 The Square is the front door of Flagler Banyan Square and is envisioned as an active urban place that will have a variety of uses and activities throughout the day. A curbless "European court" street design will connect the front door of the hotel to The Square, inviting visitors and guests to enjoy the amenities and public art at The Square. Anchoring the south side of The Square, the restaurant's outdoor seating will provide an active edge between the restaurant and the public square, creating more interest and activity for restaurant patrons and visitors to the square alike. Private events may be held on the third floor of the restaurant building, known as Rooftop Flagler. The Square will be a comfortable and engaging "outdoor room" which is vibrant and active with people. In addition to the public use at The Square, a limited number of private events may be held at The Square annually.